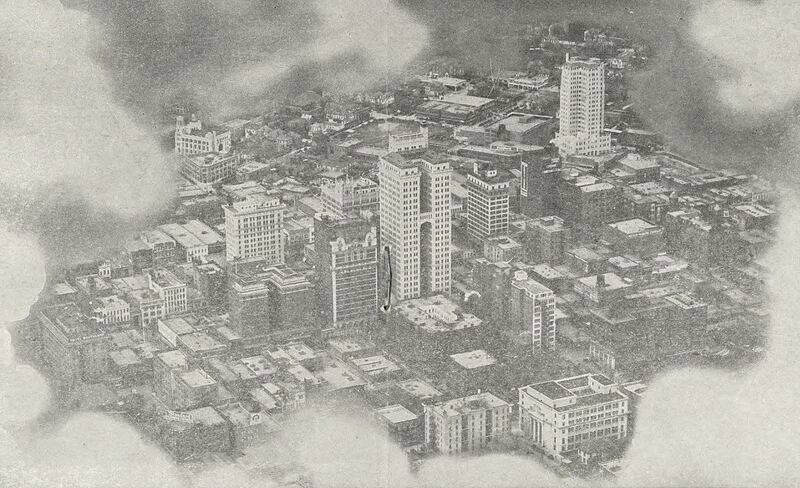 This wonderful, dream-like, “through the clouds” photo shows a growing, booming (pre-Pegasus) downtown Dallas. Photo by the Fairchild Aerial Camera Corp., from the 1923 promotional brochure Dallas from A to Z (“Where Men Are Looking Forward”), published by the Dallas Chamber of Commerce (note the publication’s staple in the center of the photo). This brochure is in the collection of the DeGolyer Library, Southern Methodist University and can be viewed in its entirety here (click the “download” button to view or save the brochure). Is the tall building at the upper right the Medical Arts Building? Yes, that is the medical Arts Bldg. Opened in 1922. I can’t help but think that someone at Fairchild worked those clouds over a little. It looks more like a view through cauliflower. That’s pretty cool! I live in Dallas and cover some dallas history on my blog. The photo is pretty much unrecognizable compared to today’s downtown.